Can I buy straight from your lot, or do I need to place a separate order? We try to keep a good selection of inventory in stock at each of our authorized dealer locations, ready for sale and delivery. However, if we don’t have exactly what you’re looking for on site, we can certainly order it for you! What size/style of shed is right for me? 1. How do you plan to use your building? Will you be using it primarily for parking, item storage, workspace, or other applications? 2. If you’ll be using your building for storage, a good rule of thumb is to measure each of the large items you’ll be storing (vehicles, lawn mowers, etc. ), and then add a few feet to that so you’ll have easy access to those items. Many of our customers tend to come back and say they wish they’d bought a larger shed from us, so we always recommend choosing one size larger than you THINK you’ll need. This also gives you some room to grow! What will my shed be constructed of? What types of standard building materials do you use? Pioneer uses only the finest-quality materials in constructing each of our portable buildings, including: 4”×6” notched runners, 2”×6” pressure-treated floor joists, 5/8” LP® ProStruct Flooring (except the Gambrel and Classic, 3/4”), LP® SmartSide or LP® Lap Siding (both resistant to termites and rot), 2”×4” rafters with 7/16” OSB roof sheathing, and your choice of either shingle or metal roofing. We pride ourselves on our quick delivery turnaround. In-stock inventory sales typically only require 3-5 business days for delivery, while special orders average between 10-20 business days for delivery in most areas. A delivery professional will contact you a few days ahead of time to schedule a date and approximate time for delivery. FREE DELIVERY provided within 50 miles of any of our 12 authorized dealer locations! You’ll get a follow-up phone call from our Customer Care team to go over all the details of your order. We’ll make sure we have all the information we need to build your shed the way you want it, and we’ll answer any questions you may have. At this time, you will also get an estimate of when to expect your delivery. What about restrictions or permits? It is the customer’s responsibility to ensure that the building is permitted (if needed) in the intended location. We strongly recommend contacting your local ciy and county agencies ahead of time to learn about any zoning, permitting, setbacks, or covenant issues. You should also contact your local homeowners association (if applicable) to learn what neighborhood rules and regulations may apply. If you need stamped drawings, schematics or additional information, just give us a call, we’re here to help! Depending on the specific requirements, additional charges may apply. Free delivery within 50 miles of sales lot, and normal setup is included in the price. Customer is responsible for all permits and zoning. Pioneer is not responsible for damage to yards, driveways or underground utilities; it is up to the customer to ensure the ground site is suitable and that utilities are located before install. What is your standard warranty? Or what are the warranties on my new shed? We will deliver your shed free of defects! We’ll provide a 1-year limited warranty covering all materials and parts from the very base of the floor to the last shingle on the roof. In addition, LP® provides a 50-year warranty on the LP® Siding, the Architectural Shingles are covered by a 35-year warranty, the metal roofing is a 40-year premium metal, and our floors have a 10-year water-resistant warranty from LP® Pro Struct Flooring. Working with someone you can trust is important to Pioneer. We require all of our installers to maintain appropriate liability, vehicle and workman’s compensation insurance. In addition, each installer must pass a rigorous background check and complete our training program before becoming certified as a Pioneer Portable Buildings installer. It is not a common practice to tip installers. We already pay our installers to deliver and install your shed! I don’t need a large barn or building; I just need some space for outdoor storage. What are my options? Pioneer has a full range of portable building options, including cabins, garages, barns, and utility sheds in a variety of size models. We can help you find the perfect storage solution! Do you have buildings in stock that are available for immediate delivery? Absolutely! We try to keep a good selection of inventory in stock at each of our authorized dealer locations, ready for sale and delivery. Contact your nearest dealer to learn about what we have in stock. And if we happen not to have exactly what you’re looking for on site, we’ll be glad to order it for you! Do you use high-quality lumber to build your portable storage buildings? In a word … yes. We source high-quality lumber for each structure, and our wood is kiln-dried to ensure that it remains straight and true. Working with the best materials enables us to create durable designs that can withstand both changing seasons and extreme weather conditions. What makes Pioneer Portable Buildings different from other portable building brands? • We control the entire process, all the way from ordering to delivery – no subcontractors! Do buildings come with electrical outlets and/or lights? As a rule, no, but this also depends on the type of building you choose. We’re always happy to talk with you about customization options! Does the installer remove and replace obstacles to be able to get the building moved in? No. Any necessary obstacle removal and replacement is the homeowner’s responsibility, and should be planned for ahead of the install. Can the sheds withstand high winds? All of our structures at Pioneer Portable Buildings are rated for 120 mph wind speeds. If high winds are a threat in your area, we highly recommend that you secure your building with tie downs and/or anchors. What is the snow load rating on your sheds? All of our standard buildings are rated for 30 PSF (pounds per square foot) snow loads. Would I be able to get shingle, paint or siding samples? Certainly. If you can’t get a good enough idea of how our colors look in our catalog or on the website, give us a call and we’ll be glad to mail a specific sample out to you, free of charge. How will I be notified once my shed is ready for delivery? Once your shed is built and ready to go, our delivery department we’ll give you a call to set up a convenient time for delivery that works both with your schedule and that of the delivery driver. In winter you’ll typically receive a call from us approximately 1-4 days after the building is completed, and in summer it may take a few days longer, due to higher demand. LP SmartSide Trim & Siding is manufactured by LP Outdoor Building Solutions. It is an engineered wood strand technology with advanced durability for longer-lasting beauty. It comes treated with a proprietary SmartGuard process to resist termites and fungal decay. LP SmartSide Trim & Siding holds up in extreme weather including moisture, hail, freeze/thaw cycles, and up to 200-mph wind gusts. This siding is backed by the manufacturer with one of the best warranties in the business — 5 Year 100% labor, as well as a 50-year prorated limited replacement warranty. We use specialized paints and mildew-resistant urethane rustic ‘stains’ approved for LP siding by Haley Paint that are proven to maintain their appearance for 10 years with proper maintenance. It is not necessary for you to be present for every phase of the process. We do ask that you are initially available to show our shed installer where you want your building placed, and that you’ll be available upon completion to do a walk-through inspection with our installer. Site preparation is usually pretty simple! We do require the installation area to be cleared and prepared to within 6″ of level (front left, back to front), and we need at least 3′ of clearance around and above the building site (4 feet if your building is larger than 160 sq. ft.). We also ask you place four stakes in the ground where you want the four corners of your building, and a fifth stake where you would like the center of the door opening. We will also need access to electricity within 150 feet of the unit, and unobstructed access to transport your materials to the building site. Other than that, we’ll take care of the rest! Can you help me with my foundation? Does Pioneer Portable building do any of the site prep? No, we do not do site preparation or foundation work. Your site needs to be prepped before we arrive to install your new shed. We recommend that you use an exterior porch and floor paint. If you plan on storing powered equipment inside your shed, it’s best to use garage floor paint for that purpose. The installation surface is really up to you; our only requirement is that you have a level location for your building site. Our buildings are designed to rest directly on their skids. In order to level, we use a jack to raise the building until it is level, then we block underneath it with ground contact-rated, treated wood blocks. If I want a gravel installation surface, how much gravel should I put down? The most important part of a foundation site for a shed or garage is a perfectly level base; otherwise the shed frame may twist, and opening of doors and windows will be difficult. If you choose to have a gravel installation surface, we recommend you put down several inches of Class 5 (road) gravel or granite fines, and for the base to be compacted. What if the area where the building is to be placed is 2 feet or more out of level? If your site is 2 feet or more out of level, we highly recommend buying concrete blocks. We recommend 4-inch thick, solid cap blocks. Thinner blocks tend to crack, and blocks larger than 4 inches cause the building to be higher above the ground and thus more difficult to access. It’s best not to place the blocks before the driver delivers the building; just have them placed nearby the installation site. Do I need to have my building anchored down? Pioneer does not offer anchoring services, but we do highly recommend that your building be anchored down to reduce the risk of accidents or damage. A vertical space of 14ft, measured from the ground to the top of the building when it is on the trailer, is required. Be sure to take any tree branches and utility wires into account when planning for your installation site. The driver will still need a minimum of 2ft of space to maneuver the truck laterally. For example, a 12ft-wide building will require a 14ft-wide space for maneuvering. Please take tight turns into account when considering your install location, as well. It can, but we honestly do not recommend it. If you have the option, we suggest that sheds be built on concrete slabs, augmented by solid cement blocks. I have an existing concrete slab, can you place my new shed on that? The vast majority of our buildings are constructed on our wood floor system which is sufficient for most any application, but we do have the ability to construct your Pioneer Portable Building on an existing slab. In order to do this, your slab must be appropriately sized for your building, and it must be level within ½”. Because of the individual nature of each slab, it’s best to contact us to determine if your slab meets our specifications. Due to the additional installation labor and extra materials needed to properly secure the shed to your slab, there is no reduction in overall price if you choose to install on a slab. Will my shed come fully assembled? Absolutely! Your shed will be placed on your installation site fully assembled, leveled by our professional delivery technicians, and ready to use! What if the entrance to my yard is not wide enough due to trees, fences, or other factors? We will be happy to build your shed on-site for an additional cost. In this case, please add two weeks to the anticipated delivery time. Note that Pioneer does not take down fences or provide tree removal. You are responsible to check with your HOA, county, and/or city for any restrictions or regulations, and to obtain any necessary permits. Pioneer does not pull any permits for your shed. Will you haul away my old shed? No, Pioneer does not provide pick-up or take-away service for an old shed. If you would like your old shed moved within your yard, though, we can arrange that. Just give us a call to discuss it! No! The price of accessory installation is included with the cost of the accessory. Most often, yes! A Pioneer Portable Building is completely customizable. You choose where you want your windows and doors, and as long as your configuration fits with the size of the structure, no problem! You also choose your siding, trim, shutter and shingle colors. Want more options? For an additional cost, you can add another window, upgrade to a house door, add a loft, skylight, workbench, shelves, and much more! Our standard window size is 2’ x 3’. The larger windows come in 2’ x 3’ double-pane window and 3’ x 3’ window options. Are the shutters and flower boxes made out of wood? 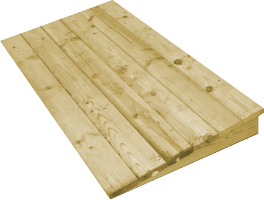 They are made out of the same LP® Wood Product material that we use on our sheds, and it comes with protection against fungal decay, termite damage, and weather extremes. What size is the single wood shed door? The solid door is 36 inches wide. The 9-lite door is also a 36-inch-wide door. What size are the double wood shed doors? The double doors are 70 inches wide, and include a transom window overhead. What size are the garden shed doors? The garden shed door is 6 feet wide. What size are the fiberglass 9-lite doors? The fiberglass 9-lite doors are 36” wide. What size are the roll-up doors? There are two sizes of roll up doors, either 6 feet or 9 feet. You will always receive the largest door that your shed will allow. If you are going to park a mower, riding toys, motorcycle, or any vehicle inside your shed, then it’s a good idea to purchase a ramp for easier access. I can park my vehicle in a shed!? Pioneer has several garage and lofted barn garage models that are designed for storing heavier vehicles like cars, ATVs, lawn mowers, etc. In most cases yes, depending on the size of the unit and the distance required. Please keep in mind that each Pioneer Portable Building is hand-assembled and installed on your lot, and moving the building after installation will void your warranty. That is why we request your presence at the beginning of the installation phase, to ensure you choose the proper location for your building the first (and hopefully last!) time. I love my Pioneer Portable Building, but now I’m interested in some more customization. What are my options? We offer a wide array of options and accessories, and we can help you to customize your building to meet your specific needs. When placing your order with one of our sales associates, please be sure to communicate your needs and intended use, and we can ensure that you get the appropriate accessories. If for some reason you feel that an additional accessory or option is needed at a later date, just give us a call and we’ll be glad to quote you an installed price. Remember though, it’s always more cost-effective to order all the options you think you may ever need when making your initial purchase! Sorry, we do not offer any removal services. We can arrange to move your old shed elsewhere in your yard though, just reach out to us about that ahead of time. If you need to have your old shed removed, try looking for a shed hauler or barn mover in your area. Any large truck with a flat bed also tends to work pretty well in many cases. The website says free delivery, so why was I charged for delivery? Pioneer is happy to provide FREE building delivery and setup within 50 miles of the dealer nearest you, in order to help make your buying experience as painless as possible! If you happen to live more than 50 miles from a dealer location, there is an additional charge for delivery service. Rent-To-Own (RTO) is a simple, affordable program designed to allow you to start enjoying your dream portable building NOW and just pay as you go, month-to-month! There is NO credit check required with our RTO program! Choose from our 36-month, 48-month, or 60-month programs. Should life throw you a curve ball, or you simply don’t need your building anymore, simply call us and we’ll retrieve the building at no further cost or obligation! What forms of payment does Pioneer accept? We accept all major credit cards, debit cards, and personal checks. Yes they are! We have 36-month, 48-month, and 60-month RTO options for all of our Pioneer Portable Buildings. The initial payment amount due will be calculated based upon the length and style of your chosen building. Just reach out to us for more details! Are the initial RTO rent payments applied towards the first 2 or the last 2 rent payments? The initial payments are applied to the last 2 rent payments. In the case of a 36-month contract, your initial 2 payments are applied to the 35th and 36th payment of the contract. Are there prepayment penalties for paying the RTO contract off early? NO, there aren’t any prepayment penalties! You are free to pay off the balance at any time once your initial 2 rent payments have been made. You are only charged the “Lease Fee” for the months or any partial month prior to paying the balance (termination) of your contract. Do we get the RTO security deposit back? The security deposit will be returned to the lessor after successful final termination of the agreement has been met, barring any fees that may need to be addressed.